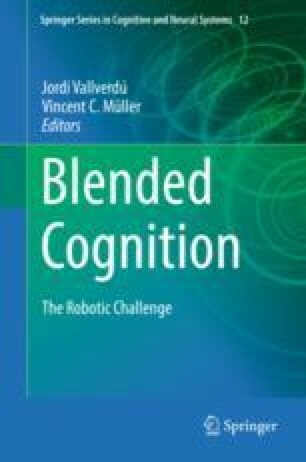 Situated within the context of the emerging concept of blended cognition between human and artificial entities, the present brief paper suggest that emphasis should be placed on the concept of automation in humans and (artificially intelligent) machines in order to understand clearly how unclear the opposition between the two categories is. After a short introduction on the relevance of artificial intelligence in various levels of the social fabric, such as policymaking and business strategies, and a discussion on the ill-defined conceptualization of several related terms such as “artificial,” “intelligence,” “consciousness,” the paper investigates “automation,” “automatism,” “automaton,” and “autism,” from psychoanalytical, cybernetic, control systems theoretical, and psychological perspectives, in the context of a Wittgensteinian language-game, drawing comparisons which in turn result to a number of remarks on the relationship between human and artificial agents. Firstly, it appears that human consciousness is deeply associated with non-automatic behavior while its unconsciousness is related to automatic expressions, whereas machine behavior is deeply associated with automatic function with unconsciousness being its only form of expression. Suggesting, however, a flatter ontology based on the concepts of infosphere, treating both humans and machines as inforgs, it is recommended that we think about the unexplained part left in the model of the following quadrant: (a) human non-automatic conscious, (b) human automatic unconscious, (c) machine automatic “conscious,” and (d) X. The paper concludes that by borrowing the algebraic method of cross-multiplication, multiplying (a) to (c) and dividing the result by (b), that is, investigating empirically the relationship between everyday interactions of conscious humans and unconscious machines, and then analyzing the results according to topics concerned with unconscious human behaviors will help creating a rather clearer view of what constitutes X, that is, what is actually feared in the expression of erratic machine behavior sometimes mistakenly understood as conscious.